After experiencing power outages during a 2007 ice storm in Springfield, Missouri, Dickerson Park Zoo officials improved their backup power and heating systems to keep animals - like Henry, pictured here -- safe and warm. 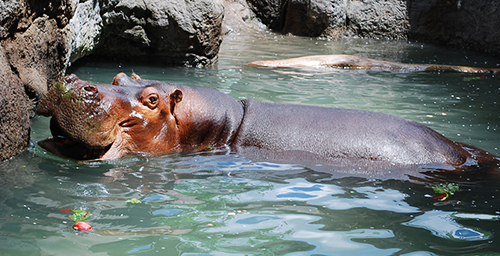 University of Illinois clinical epidemiologist Yvette Johnson-Walker, a clinical instructor in the department of veterinary clinical medicine, contributes to emergency preparedness efforts at zoos and aquariums across the U.S. These are among the many potential disasters the managers of zoos and aquariums ponder in their emergency preparedness drills and plans. But these stories are not just worst-case scenarios: The events described above actually happened, and the aftermath - often heroic, and sometimes tragic - depended in large part on the institutions' preparedness training, planning and forethought in calmer times. 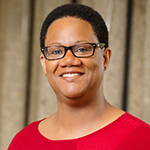 When bad weather strikes or illness invades, zoos and aquariums are among the most vulnerable facilities affected, said University of Illinois veterinarian Yvette Johnson-Walker, a clinical epidemiologist who contributes to emergency response training efforts at animal exhibitor institutions. She is a clinical instructor in the department of veterinary clinical medicine at Illinois, and lead author of a new paper on emergency preparedness at zoos and aquariums in the journal Homeland Security & Emergency Management. Some animals are likely to suffer if the electricity goes out for long, she said. Others are large, skittish and dangerous under normal conditions. Training caretakers and keepers to minimize their own risks while attending to their animals in an emergency is a challenge, but leads to the best outcomes, she said. In 2012, Johnson-Walker joined forces with Yvonne Nadler, a project manager with the Zoo and Aquarium All Hazards Preparedness Response and Recovery Center, to bring vital emergency training to accredited animal exhibitor institutions in Illinois, Indiana and Missouri. This effort, funded by the U.S. Department of Agriculture and supported by the Association of Zoos & Aquariums, has since expanded, providing training to staff from zoos and aquariums in 23 states. The trainings, dubbed "Flu at the Zoo," focus on avian influenza, a viral disease that spread in the 2000s among wild and captive birds and also infected hundreds of people, primarily in Asia, Africa and the Middle East. Bird flu serves as a useful model scenario to help train participants in basic preparedness skills. One such skill is familiarity with the Incident Command System (ICS), a framework developed by firefighters and adopted by the Federal Emergency Management Agency (FEMA) that allows first responders to quickly set up their emergency response operation and assign vital tasks. The ICS has long been used by public safety, law enforcement and public health entities involved in emergency response. "We wanted zoos and aquariums to have a seat at the table when there's planning for how we're going to respond to emergencies, and to be able to fit into the system, know who to talk to and how to communicate," Johnson-Walker said. It's also important to recognize the other responders and understand their roles, she said. If the event involves a disease like bird flu, the USDA, FEMA, National Institutes of Health, state veterinarian, state and federal wildlife services, public health authorities, veterinary organizations, police, hospitals and perhaps even local poultry operations will be involved in the response. Knowing who does what can speed communication in a crisis. Planning also helps managers make best use of the limited supplies or equipment they have on hand, Nadler said. "There are certain types of livestock trailers, for example, that can be adapted to moving big cats," she said. "Is that your preferred method of movement? Of course it isn't, but in an emergency that might be your only option." One beneficiary of the emergency training, Melinda Arnold, knows firsthand the value of preparedness. Arnold is public relations director for Friends of the Zoo, affiliated with Dickerson Park Zoo in Springfield, Missouri. The zoo suffered a blackout during a 2007 ice storm that shut off power for most of the city for several days. "We did have backup generators," Arnold said. "The greatest problem with the generators was that those fueling stations in town that did have gas didn't have power, so they couldn't pump the gas." Zoo staff had to travel many miles outside of the affected area with gas cans to collect gas to run the backup generators, she said. "Now we have some propane-powered backups," Arnold said. A more recent incident at the zoo, the accidental death of a zookeeper in 2013, caused Dickerson Park Zoo officials to re-evaluate all of their safety protocols. Even though the zookeeper had decades of experience and was guarded by a protective barrier, a skittish elephant rushed him at an unguarded moment, and he fell and was trampled to death. "It made us step back, not only in our elephant management but in all areas of the zoo, and look at our safety procedures and points of contact with dangerous animals and evaluate those safety conditions and make improvements," Arnold said. The preparedness plans, drills, discussions and training all help zoos and aquariums reassess their procedures, even those that seem to be safe after decades of operations and no major incidents, she said. To reach Yvette Johnson-Walker, call 217-333-1903; email yjjohn38@illinois.edu. To reach Yvonne Nadler, email dr.yvonne.nadler@gmail.com. To reach Melinda Arnold, email marnold@dickersonparkzoo.org. The paper, “Flu at the Zoo: Emergency Management Training for the Nation’s Zoos and Aquariums” is available online or from the U. of I. News Bureau.